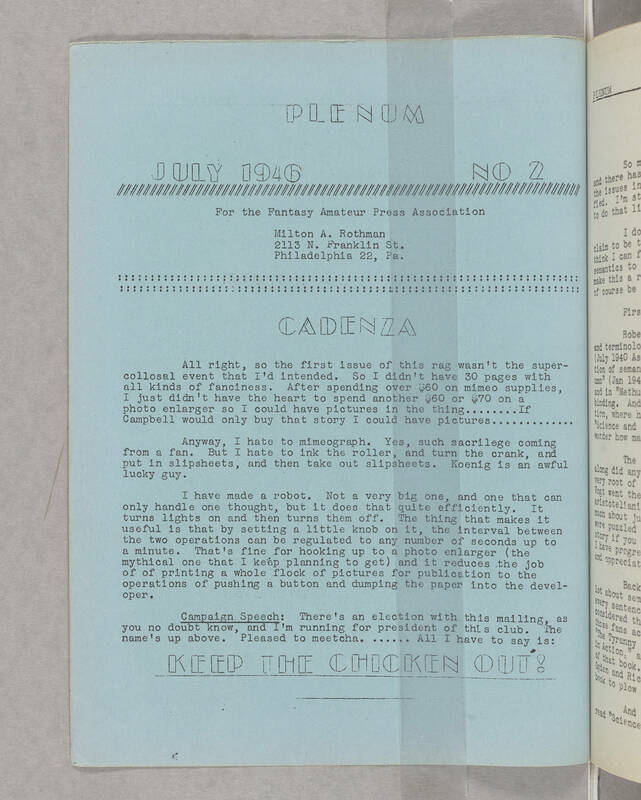 PLENUM JULY 1946 NO 2 For the Fantasy Amateur Press Association Milton A. Rothman 2113 N. Franklin St. Philadelphia 22, Pa. CADENZA All right, so the first issue of this rag wasn't the super-collosal event that I'd intended. So I didn't have 30 pages with all kinds of fanciness. After spending over $60 on mimeo supplies, I just didn't have the heart to spend another $60 or $70 on a photo enlarger so I could have pictures in the thing........If Campbell would only buy that story I could have pictures............. Anyway, I hate to mimeograph. Yes, such sacrilege coming from a fan. But I hate to ink the roller, and turn the crank, and put in slipsheets, and then take out slipsheets. Koenig is an awful lucky guy. I have made a robot. Not a very big one, and one that can only handle one thought, but it does that quite efficiently. It turns lights on and then turns them off. The thing that makes it useful is that by setting a little knob on it, the interval between the two operations can be regulated to any number of seconds up to a minute. That's fine for hooking up to a photo enlarger (the mythical one that I keep planning to get) and it reduces the job of printing a whole flock of pictures for publication to the operations of pushing a button and dumping the paper into the developer. Campaign Speech: There's an election with this mailing, as you no doubt know, and I'm running for president of this club. The name's above. Pleased to meetcha. ...... All I have to say is: KEEP THE CHICKEN OUT!